In terms of domestic cats, large cats are those over 12 lbs. Because of their extra size and strength, the amount of pressure they will put on their cat climbing structures, furniture, etc. is much greater than the average cat which is under 9 lbs. 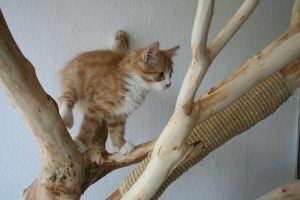 For this reason, we want to inform you of the best materials for cat trees for large cats so that whether you are buying or building your cat’s tree, your cat and your family remain safe. A fallen cat tree is not fun especially if it falls on your cat, someone else in the home or even if it does physical damage to your home in some way. What are the Best Materials for Cat Trees for Large Cats? The material is what makes up the tree. Sometimes it can be up to your cat’s personal preference but sometimes it has to be the right thing like in the case of the tree’s foundation which is usually wood or PVC. The wood is the most important part to get right because it will make up your cat tree’s foundation. It may also be the most confusing because there are soooo many different kinds of boards and woods. The simplest way that I can explain this is to stick with natural woods. Whether it is plywood or solid wood, they will stand up much better than engineered wood like MDF. Avoid that stuff like the plague. It won’t work for cat trees for large cat breeds no matter how much you wish you could use or get the cheaper tree. I can relate, being a tall woman, I have to get the more expensive clothes especially in the winter. Sometimes its a pain but when you really calculate your expenses you’ll realize that most of the time you end up saving in the long run. Anyways, back on topic, of the natural woods. Choose ones that are well-known for their strength and durability like pine, oak, maple or whatever you prefer. I’ve always been a fan of cedar. I just love the smell of it and it is good quality wood for building with. Cats like to lounge on soft warm places. For this reason, it is common for cat trees to be covered in carpet. Since cats also like to scratch the carpet, it is important that you choose a high-quality carpet that is fit for the job. Another trick that I’ve seen in some trees is that they’ll glue the entire sheet of carpet down just to keep it extra secure. You don’t have to choose the most expensive carpet for your cat tree. Just make sure that it is soft and comfortable for your cat. As I mentioned before, cats like to scratch. But of course, you already knew that. Usually, the carpet is the receiver of their horizontal scratching. But more commonly, cats like to scratch while stretching vertically. Some tree makers use carpet to handle the job but the best material for this is natural sisal rope. Make sure that it is untreated so that you don’t accidentally expose your cat to harmful chemicals or conditions. I think with size it is natural for us to lose sight of the ‘cuteness’ factor. I feel you large cats. Again, struggles real as a tall woman and even as a tall girl. But my experience has helped me to be able to relay to you the message that size doesn’t change things like age or other necessary factors. Just because your cat is bigger doesn’t mean that it doesn’t need or want to play with toys especially if it is a kitten or adult cat in it’s prime. Like a larger dog, larger cats will need more heavy duty toys. Stick with ones that are bigger and sturdier. If you can find toys made of wood, that will also be a plus because then you know its stronger. You can also buy bigger, automated toys. One other tip is that you can be creative. Look around the pet store and see what other toys are in other departments. For instance, you might not find a big ball in the cat department but you might find one in the dog department or if you’re thinking what I’m thinking, you can get a big hamster ball for it. Attach it to a regular rope and you have yourself a DIY, heavy-duty cat toy that your cat will love. You can also save your cardboard boxes whenever you order something big from the internet. My cats always enjoy playing in them. As a matter of fact, so does my daughter, lol. I can just throw a couple of boxes in the floor and the three of them will entertain each other! Now I hope that I have helped you decide what materials to use. If you have any questions, comments or other feedback, please leave them in the comments box below. If you are looking for recommendations on cat trees for large cats, click the button below. Having owned a big cat I certainly understand how much more they apply pressure having destroyed a smaller cat tree. 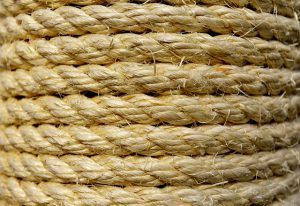 The sisal rope is a great idea that I had not thought about. Hey Geoff! Thanks for sharing ur experiences with us. Hope u have n awesome day!